Daydreams of Quilts: It's My 4 Year Blogiversary Today! Of Course I'm Having A Giveaway! It's My 4 Year Blogiversary Today! Of Course I'm Having A Giveaway! Hi everyone! Today is my 4 year Blogiversary! (And tomorrow is my 15th Wedding Anniversary so come back tomorrow if you want to see wedding pics.) I have some finished projects to show you and two giveaways at the bottom of this post. This is my 251st post! Here is a link to my very first post. How funny that I just restarted my Farmer's Wife Quilt last month from scratch. Sewing it really scrappy was not working out for me and I wanted it matchy-matchy. Plus, I didn't have my printer settings set to 100% actual size when I printed ALL the templates. It's all a learning experience though and my freshly reprinted templates are the correct size this time around. :) Click here to see my three new Farmer's Wife blocks from my Instagram feed. So, here are my finishes that I have to show you plus one WIP that I'm making serious progress on. 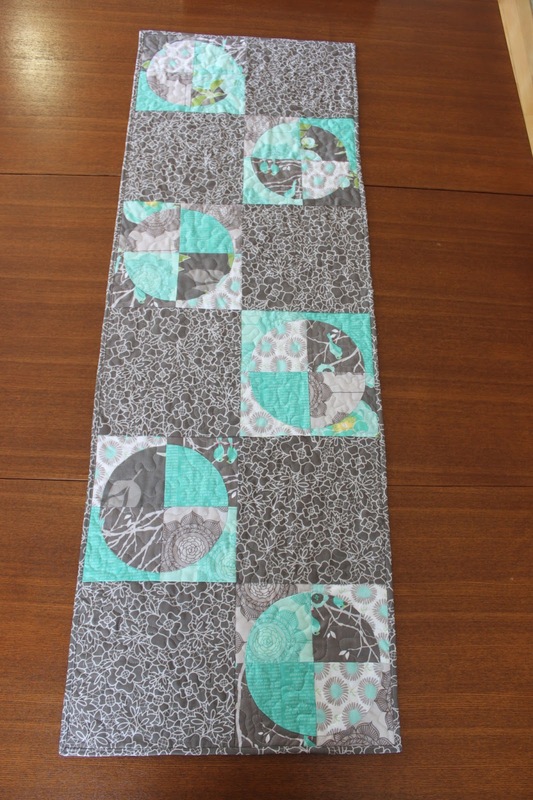 First up is my "Modern Quilt Guild Riley Blake Fabric Challenge" project. I received a bundle of free fat eighths from the MQG to work with. This is the "Cottage Garden" line by Amanda Herring of "The Quilted Fish". The challenge was to use only fabrics from this line, and coordinating Riley Blake solids, and to sew something we've never sewn before. I have never sewn Drunkard's Path blocks before so this was my first ever time sewing them (I started these before my "Horizon Lines" mini). I have Angela Pingel's book "A Quilter's Mixology" which is a great book for learning curved piecing. I love it! She has an awesome tutorial on her YouTube Chanel and that is the method I used to create these blocks. One pin people! Such a time saver! I made a table runner with my Drunkard's Path blocks. Here is a close up of my machine sewn binding. The backing fabric is also from the same line of fabric in the pink colour-way. Next up are my Vintage Camper Trailer projects that I made for Lisa in my #Canuckbdayclub over on Instagram. She was the July birthday girl and I found out that she likes vintage camper trailers. I made a hoop using Tula Pink fabrics. I was so happy I had a brain wave and remembered this camping fabric with the tents from her Moonshine line. It was perfect if I do say so myself! The little felt camper is a pin cushion but both Lisa and I say it's too cute for pins. The hoop art is a free pattern at Flamingo Toes. Click here for the tutorial and pattern. Vintage Camper Trailer bunting. How cute! I made them out of all Tula Pink fabrics and used buttons for the tires and door knobs. Who remembers "The Polka Dot Door" from being a kid. Yes, I'm dating myself here. I love the look of the pinapple fabric on the door. And one last little trailer. A closer look at the hoop. I didn't have any cute pom-pom trim but I glued the same ribbon as the hanging ribbon all around the edge of the hoop. The vintage trailer pin cushion complete with Liberty of London curtains, vintage 50's ric rac trim and a resident gnome. I seriously almost died from the cuteness when I finished this. (This took me 4 1/2 hours to make in case you wondered.) I used two black buttons for tires and two white buttons for hub caps. The other side of the trailer. The window on the front. I used two little red buttons that kind of had a "reflector" look for the tail lights. And here is my WIP from last week. It's all quilted now (by me on my Juki) and the binding is sewn onto the front. I will be sitting in my comfy IKEA Poang chair and sewing the binding down this evening. This is the "Penny Candy" quilt from Kathy Brown's book "Strip-Smart Quilts." (Martingale Publishing) The fabric is "Holiday Happy" by Monica Solorio-Snow (The Happy Zombie) for Lecien. Okay! So, thanks for coming to my Blogiversary Party!!! Here are my two giveaway prizes that I have for you from my stash. The first is 5 fat quarters of Aneela Hoey's "Sew Stitchy" fabric. 5 Fat Quarters of Sew Stitchy. The second is 6 fat quarters of Cotton + Steel basics and mustangs. 6 Fat Quarters of Cotton + Steel. Please use the Rafflecopter to enter so it's easier for me to pick the winner and there's no issue with "no reply" bloggers. If you do not use Facebook you can log in with your email. I will leave the giveaway open until midnight August 12th and will mail out the prizes to two winners on the 14th. :) Anyone can enter worldwide. Winners will be contacted by email and announced here. Thank you for celebrating with me today!